Stock photo of a man playing a musical instrument during a medieval feast at Schloss Auerbach (Auerbach Castle), Bensheim-Auerbach, Hessen, Germany, Europe. Man playing the bagpipes, a musical instrument during medieval feast at Schloss Auerbach (castle). This stock photo shows a man playing bagpipes, a musical instrument, during a medieval feast at Schloss Auerbach (Auerbach Castle), Bensheim-Auerbach, Hessen, Germany, Europe. A man wearing a white tunic plays a set of bagpipes during the medieval feast at Schloss Auerbach. The man has one of the pipes in his mouth while his hands hold another pipe with holes to play notes. Another pipe sits over his shoulder and a fourth pipe extends in front of his chest and lays on his arm. 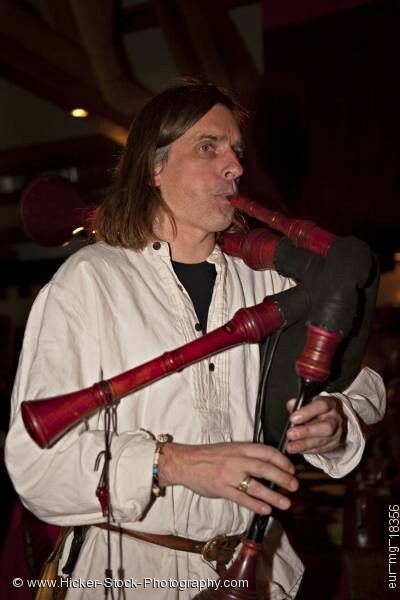 Under his left arm he holds the black bag of the bagpipes. The man has shoulder length hair and wears a black shirt underneath the white tunic. He wears a bracelet of beads on his wrist and a ring on his right hand. Man playing a musical instrument during a medieval feast at Schloss Auerbach (Auerbach Castle), Bensheim-Auerbach, Hessen, Germany, Europe.